We know diabetes can harm our eyes, nerves, kidneys, heart and many other important systems in our body. to develop gum disease (or periodontitis) when compared to people who do not have diabetes. Let's look at how diabetes and gum disease are related and what we can do to prevent and manage gum disease. 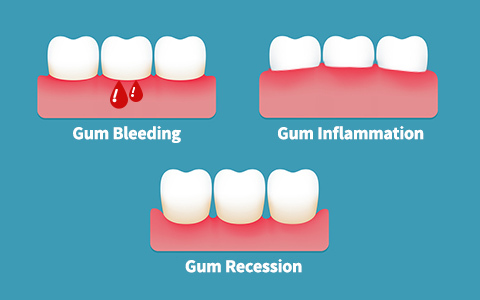 Gum disease is the inflammation of the gums caused by bacteria in the dental plaque. It is preventable, and if diagnosed early, can be stopped from progressing any further, preserving a well functioning mouth and healthy smile. Often, gum disease is painless. You may not even know you have it until advanced stages. Inflamed gums usually do not hurt, so it’s important to look out for signs of gum disease. Like other complications of diabetes, gum disease is linked to diabetic control. This is why diabetic patients with poor blood sugar control get gum disease more often and more severely. Additionally, advanced gum disease makes blood sugar control more difficult. Diabetic patients with diabetes are more susceptible to bacterial infection and have a decreased ability to fight the germs that cause gum disease. Since it isn’t always visible and rarely hurts, gum disease can be missed even though it has a significant impact on the whole body. To prevent and manage gum disease, the goal is to ensure regular plaque removal.